In my blogger profile, I state that one of my interests is making surreal utterances. The cartoon adjacent documents an actual incident in which I used a surreal utterance to good effect. It happened this way. A few days ago a person knocked at my door. He was obviously a keyed-up salesman, and he began a spiel in which he sought to recruit me to a subcription scheme (which was tied in some mysterious way to car repairs). At first, I uttered mildly puzzling responses. For example, I said I had no need of such a scheme, as I never repaired my cars. When he sought details, I said that I continued driving my cars, ignoring the need for maintenance etc until they broke down irretrievably. I then dumped them at the side of the road, and bought a new car. This type of off-the-wall response is normally enough to send the salesman on his way, but this one persisted, as my strange responses at least had something to do with cars. 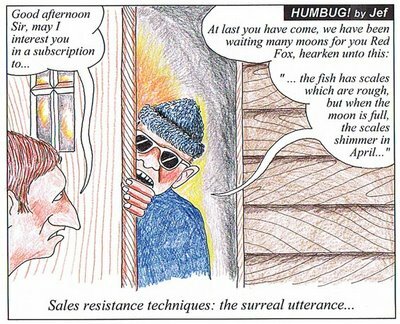 In the face of such resistance, I implemented my fail-safe option - the surreal utterance. I looked furtively up and down the street, put my finger to my lips and cautioned him to be silent. I then motioned for him to come closer, and enunciated slowly and clearly (in the manner of a secret password) "the fish has scales which are rough, but when the moon is full, the scales shimmer in April". He took off up the driveway like a scalded cat.